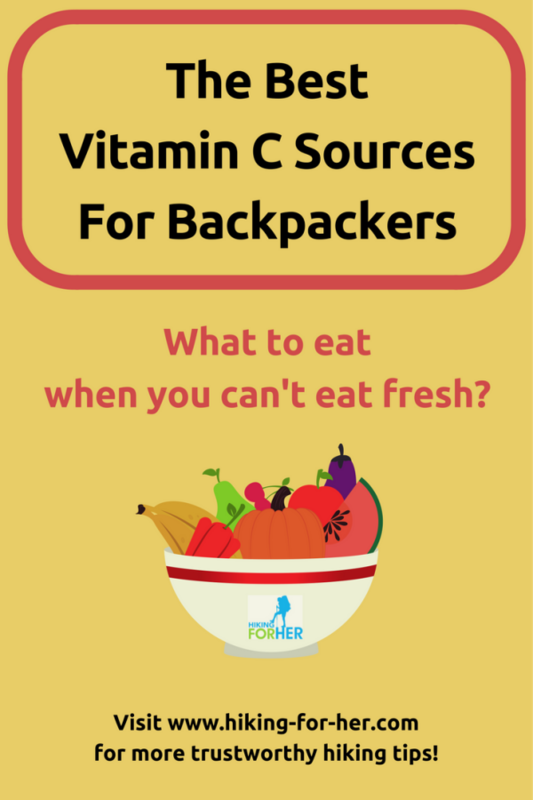 This page explains how to make the best hiking food Vitamin C choices. You already know that great backpacking and day hiking food keeps you going strong, tastes great, and is easy to pack. Now it's time to do something easy, but important, for yourself: include the best hiking food vitamin C rich choices in your trail menus. Day hikers have a huge advantage over backpackers. Vitamin C rich hiking food and fresh fruits and vegetables are one and the same. 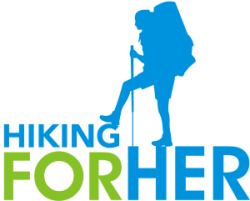 So let's get the best day hiking food ideas covered quickly, and then solve the tougher problem! Eat these vitamin C rich hiking foods! Notice that these foods are not very calorie dense, so be sure to surround them with other foods that deliver the carbohydrates you need to keep hiking: whole grain crackers, bread, pita, or bagels. And cold slices of fruit and veggies won't be appealing on a cold weather hike. Things get a little scarce in the Vitamin C department when you're out on a backpacking trip. One of your best bests is dried fruit. Tip: Keep your dried fruits in a dark, cool environment before you pack them for your trip. Vitamin C can be damaged by prolonged exposure to heat and light. This is my favorite low cost source for dried fruit that satisfies my craving for sweet, chewy goodness while delivering C to my cells: Kirkland brand. Big bags make it easy to repack, and still have plenty of fruit left for snacking at home while you're going over your gear list. What about freeze dried fruit? Fresh berries are chock full of vitamin C, but if you're not hiking in the right area in the right season, good luck with that. Instead, you can carry freeze dried raspberries, like these. Or live it up a little with mangoes! However, their bulky packaging will take up space in your backpack. And these freeze dried options don't deliver a lot of calories (which translates into a poor source of muscle fuel). They taste SO GOOD after a few days on the trail! So bring at least a small serving for a great ending to your dinner. Tip: These need to be kept away from moisture, or you'll end up chewing a weirdly textured dessert. Double bag them! Here's a fantastic way to deliver a wallop of vitamin C to your body, all in one sitting: dried tomatoes you can toss on top of your rice or grain based evening meal. Lightweight packets of powdered EmergenC have been known to travel with me not only on my backpacking journeys, but any time I travel out of my daily routine. Stress requires a higher amount of vitamin C to maintain immunity in the form of strong white blood cells. Try this sample pack to experiment with your favorite flavor(s). You'll be getting antioxidants, but also plenty of B vitamins and electrolytes, all in one delicious serving to keep your taste buds from getting grumpy. Tip: Also makes a flavorful warming beverage before sleep, useful for the rest-and-repair cycle your body will be undergoing. While all of us need a daily dose of vitamin C (currently set at an average of 80 mg across both genders), if you're hiking AND in one of the following groups, you'll need to eat even more of the hiking foods mentioned here. Can you overdo a good thing? Not with water soluble (i.e. you pee out the excess amounts) vitamins like B and C, unless you decide to sit down and eat an entire pallet of dried fruit during your rest break. Tip: Arrange for a helicopter to drop off the pallet beforehand. One good feed back mechanism to watch for: diarrhea. Back off your vitamin C sources and/or supplementation until it clears up, or can be attributed to other sources like an infection. There are so many ways to stay healthy on the trail. Vitamin C consumption is right up there at the top of the list. Pick your favorite tips from the plethora of best hiking food vitamin C choices, and your mood, collagen, and serotonin levels will thank you. If you need more hiking food suggestions, dip into this treasure trove.